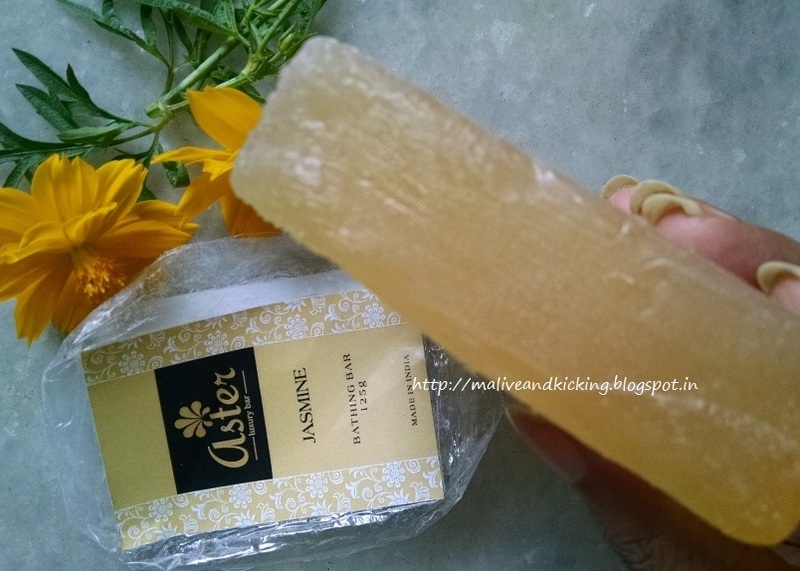 Aster Luxury Jasmine soap bar is made with highest quality natural ingredients, essential oils and extracts. This soap bar gently cleanses the skin and maintains the softness of your glowing skin. Aromatic fragrance of this soap bar is excellent for settling your nerves and relieving stress. 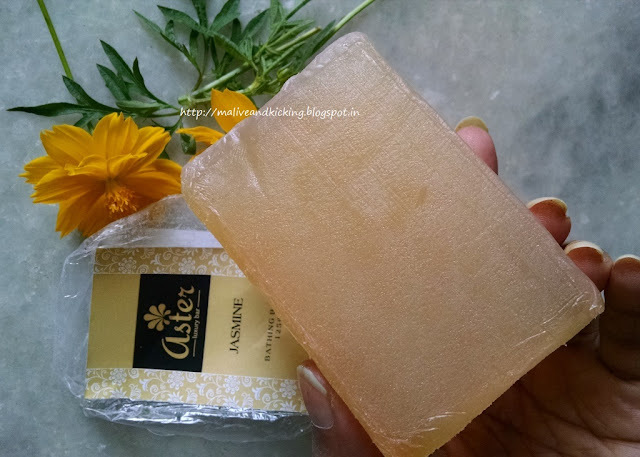 Aster luxury soaps do not contain any harsh chemicals and are 100% vegan. All our bathing soaps are good for all skin types. No Paraben. No Phthalates. No animal testing. Firmly hold the aster handmade bathing bar and run all over the wet body. This soap gives good lather that will clean your whole body. Apply lather all over body before showering off. Packaging: The soap comes double-sealed in a transparent film so you may see the lovely soap color from outside even before you open it. The packaging has label with their brand logo on the front and ingredient list, price details etc at the back of the soap. The Jasmine soap is a soft translucent bar. You may notice your fingers at the back when you hold it in your hand. (though I could not click that way to show it). The soap bar is twin shaded from light to dark. 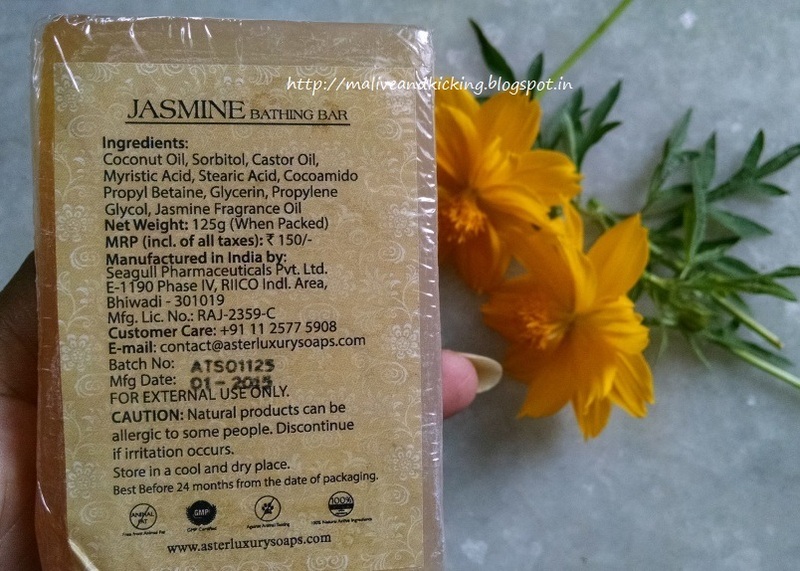 Unlike the Strawberry soap (that I used earlier), the Jasmine bar doesn't have the brand logo imprinted on it. Now I can't stop myself praising for its scent. I am deeply in love with its heavenly fragrance. Its an absolutely treat to me towards rejuvenation. It lathers richer and gently cleanses the skin leaving behind lightly scented soft skin. But it melts slightly more, so ensure drying it out after shower. But the size of soap bar is big enough to last long. 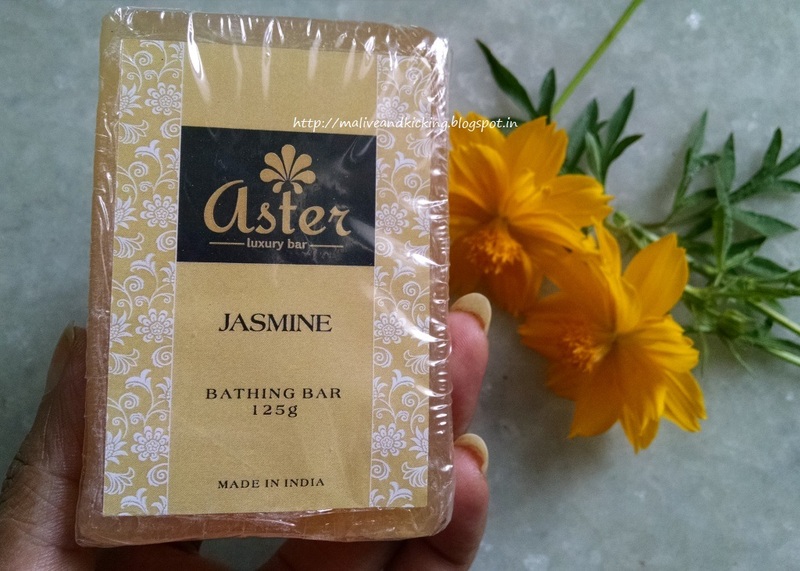 Aster Luxury Jasmine Soap can be a suitable addition to your aromatherapy ritual like mine as Jasmine oil is said to be enriched with calming and anti-depressing properties. Its regular usage increases elasticity of skin. The blend of jasmine oil with other oils is capable of stimulating incredible skin benefits.